If you are in the mood for smooching, this might be the wrong dish for you. 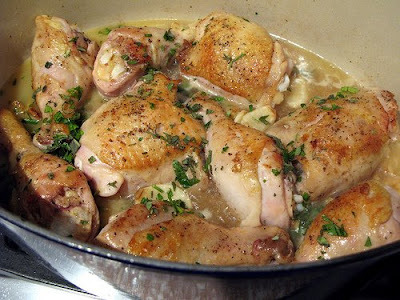 This chicken is bathed in a sauce with forty cloves of garlic, and it is unbelievably good! Ina Garten (aka Barefoot Contessa) made this dish famous. 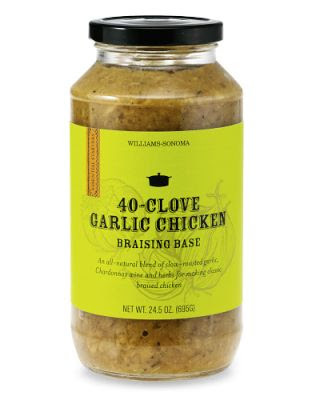 I have included the recipe below, but they are selling jars of the sauce at Williams Sonoma right now. If you are looking for a fail proof dinner that will make your entire house smell delicious, go pick up a jar, and enjoy. I bought 8 chicken thighs (boneless and skinless) and seared the outside in a little olive oil in an oven proof pot. Then I poured the jar of 40- clove garlic sauce on top and put in the oven for 45 minutes. If you have some free time and want to feel like a champ, here is the recipe from the Barefoot Contessa.